ERI Global, Inc. (ERI), CheckAlt’s latest lockbox processing client, experienced the agility and quickness with which CheckAlt implements new clients. ERI founder and CEO Bobbie Celler discovered CheckAlt’s lockbox processing webpage and submitted a message asking if CheckAlt could help him address his payment processing needs. Celler’s company handles high volumes of paper and he had become frustrated with not having checks deposited in real time. CheckAlt’s Co-Chairman and CEO Shai Stern responded immediately, connecting Celler with the key members of the CheckAlt team to identify the ideal solution for ERI. In just seven days, CheckAlt assessed ERI’s needs, scoped a plan, rerouted all of ERI’s mailed check payments to a new lockbox, set up their banking relationship, and went live with processing for ERI. “We pride ourselves on having the quickest implementations in the industry,” Stern said. “Our industry experience puts us at the leading edge for solving medical claim payments, explanation of benefits documents, and complex remittance.” In the first week after going live, CheckAlt processed thousands of items for ERI. ERI audits third party liability (TPL) medical claims resulting from auto accidents, working to identify the highest-yielding payers and collect TPL claims on their behalf. ERI works with healthcare systems and hospitals across the U.S., as well as emergency physician businesses, emergency services providers, healthcare debt purchasers, and revenue cycle management companies on complex claims and nuanced reimbursements. 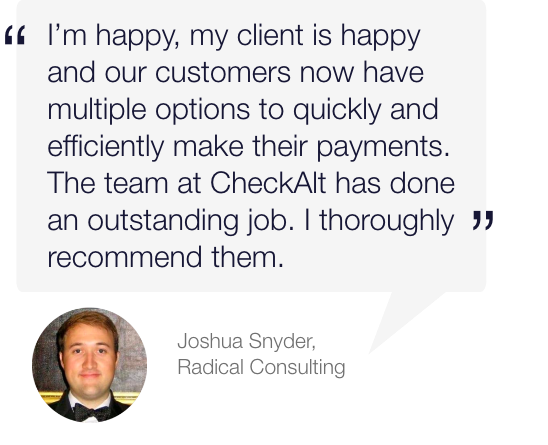 Click here for more information on how CheckAlt helps businesses like ERI process payments.